In the “socially-induced” tech world that we are living in, the old adage that “no man is an island” doesn’t hold true anymore. No matter how geek and anti-social you are, now is the right time foresake all habits, get out into the open, connect and socialize. Even for the pioneers of web 2.0 applications and tools this is now an SOP. If you want to stay cool and relevant to the social world – open up to other online sites even if they use to be your rival. Such is the case with Digg. Digg is struggling to stay relevant. After all, it used to be one of the pillars of the web 2.0 phenomenon. It won’t definitely not yield to competition easily. So the Digg folks are rolling out a couple of integration features with popular online services. First, Digg will definitely support Twitter @anywhere framework which was just announced a couple of days ago. It’s Facebook Connect integration was pretty successful, giving Digg increased in user engagement and a registration increase of around 20-30%. And after surveying around 14 thousand of its users, Digg is now ready to roll out some more integration with other third party site based on survey responses. So, aside from Facebook Connect, soon you will be able to log in to Digg using your Google, Yahoo, and Twitter accounts. These three plus Facebook are the ones identified by Digg users which they want to use when logging in to Digg. 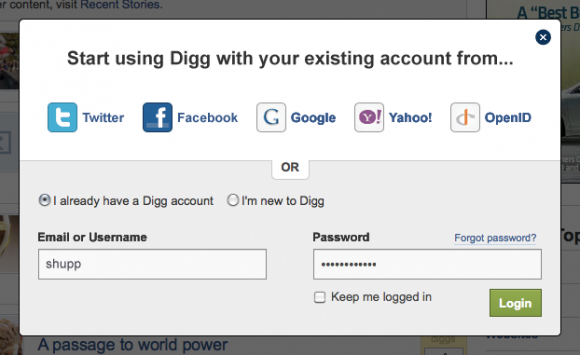 In addition, Digg will continue to support OpenID accounts. So if a third party site is supporting OpenID accounts, you can use them also for logging in to Digg.